How was arthritis pain treated in the 18th century? One option was the mustard plaster, which operates on the principle that heat generated by the plaster increases blood flow, which will reduce inflammation. Frankincense supposedly inhibits the production of molecules that cause inflammation and break down cartilage tissue, which leads to joint pain, at least in knees. This level of scientific knowledge wasn’t available to the 18th century physick, but frankincense is an edible aromatic resin with a long history of use in treating ailments including arthritis. At least you (or your breath) would smell good. The primary ailment treated of was gout, and the remedies above are mostly directed at inflammatory arthritis, the kind where joints grow red and swollen. Think of wealthy, overweight men drinking port with swollen feet propped up on footstools: that’s gout. 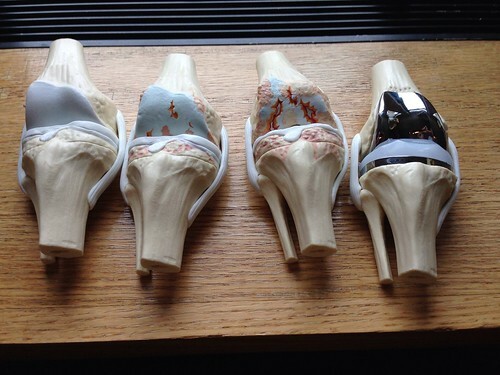 Models showing progressive arthritis in a knee, followed by joint replacement. Then there’s osteoarthritis, or degenerative joint disease, once included in the catchall and obsolete term, rheumatism. This is a different matter, where changing your diet and icing the joint generally won’t bring much relief. When your cartilage is gone, your bones rub together. Osteophystes or bone spurs form is response to damage or inflammation, and cause both pain and noise. In pre-Revolution Boston and Rhode Island, there were various cures advertised promising far more benefit than they were likely to deliver. 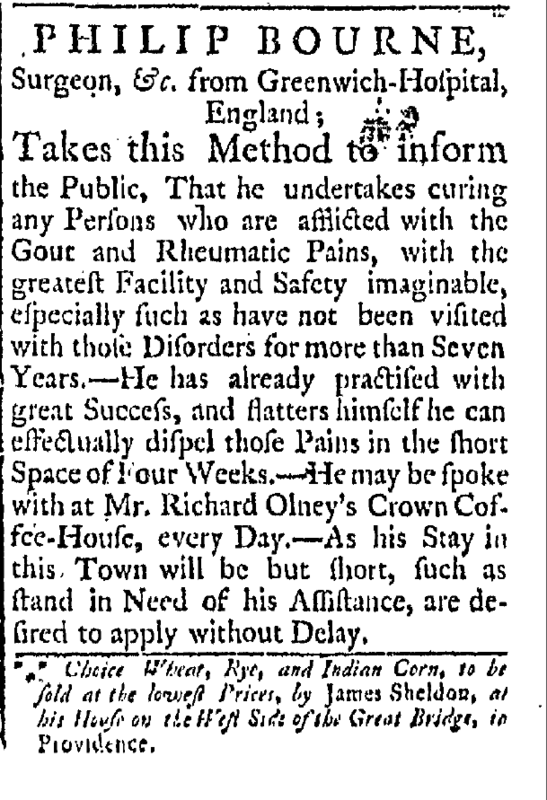 Phillip Bourne, from Greenwich Hospital in England, promises to “undertake curing any Persons who are afflicted with the Gout and Rheumatic Pains, with the greatest Facility and Safety imaginable.” The caveat about “especially such as have not been visited with those Disorders for more than Seven Years” is particularly nice, since the longer pain persists, the harder it is to treat. He knew his limits, I suppose, if only of his patience, or the amount of time he could safely ‘practice’ in any location. Boston Gazette, February 14, 1774. 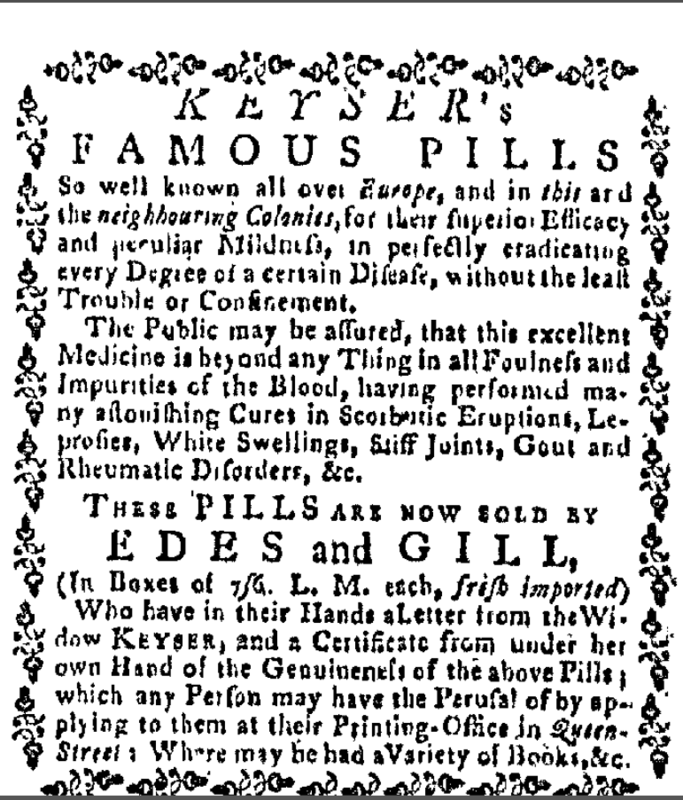 Edes and Gill sold Keyser’s Famous Pills, “So well known all over Europe,” and promising much, like Cures for Scorbutic Eruptions, Leprosies, White Swellings, Stiff Joints, Gout and Rheumatic Disorders, etc.” I don’t know about you, but I think I’d prefer to have my scurvy treatments separate from my arthritis treatments. Ultimately, the best option was probably a crutch or cane, though braces were devised and are still used, along with crutches and canes. All that prevents their use or efficacy is the vanity of the user. This is great, KC! I wish my dad was still alive–he and I would always chat about those ailments treated in PBS Masterpiece shows, where the country doc would come out of his office with a little vial of something awful looking, that he’d mixed himself, swearing it would cure whatever. One fine exception was Dr.
Ennis in Poldark, who figured out that his patients were suffering from scurvy not because there was no medicine, but because the best medicine was fresh vegetables, hard to come by in winter, and too expensive at any rate for the miners and cottagers he treated. Where, by the way, do you find all the wonderful Paul Sandby illustrations? And are they mostly of Engish country and city life? Is there a corresponding artist from the Colonies, too? Keep up the good work! I look forward to some nice warm hand sewing tonite, its so cold this AM. I can hardy type!! I have a strange fondness for old medicine, though I have never been to the Mutter museum. I find the Sandby images at the Yale Center for British Art and the Royal Trust, though this turned up on Pinterest in the feed of someone I follow. (Jane Austen’s World.) I just tracked it back to the Wellcome, and found it had inspired the whole post. There is not an artist like Sandby for the colonies that I have found. There may be one yet, undiscovered, but I can’t think of a comparable vastness of images in North America until about 1818. It’s still cold here, and I am grateful for radiators and wool socks!